Royal Police Force Band on Bahaman’s banknotes Parting from traditions of featuring flora, fauna or famous personalities on banknotes, Bahaman’s 1984 1 dollar banknote has its Royal Police Force band on its reverse! 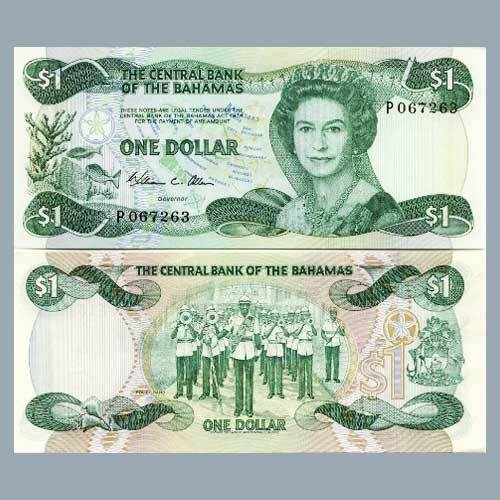 The obverse of the currency note has a portrait of HM Queen Elizabeth II to right and fish and coral to the left with the map of Bahamans in the background. The reverse features the famous Royal Police Force band of Bahamans in the centre with the coat of arms of the Commonwealth of The Bahamas on the right along with a conch to left. This Royal Police Force band is a world-famous cultural icon throughout the Commonwealth of Bahamans. The Royal Bahamas Police Force is the national law enforcement agency of the Commonwealth of The Bahamas and was established on 1st March 1840.